Getting a paycheck usually feels great -- for you and Uncle Sam. When you look at your pay stub, you'll see all of the money withheld for various taxes, some federal and some state and local. In some cases, however, you won't have any taxes withheld, but this doesn't mean you're off the hook. Any applicable income taxes, including federal, state and local income taxes, are generally withheld from your paycheck. The amount of the withholding depends on the number of exemptions and filing status claimed on Form W-4, which you fill out when you start a new job. Obviously, if you live in a state or locality without income taxes, you won't have have state and local taxes withheld. 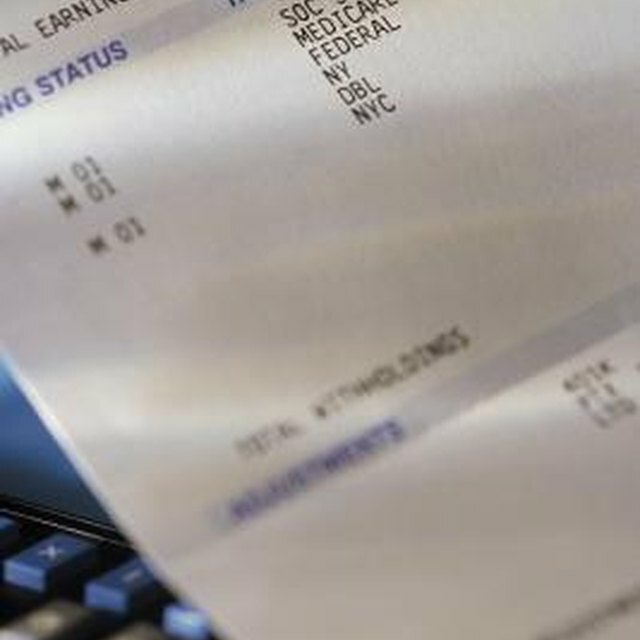 Payroll taxes, which include the Social Security tax and the Medicare tax, are also withheld from your paycheck. The Medicare tax is 1.45 percent for both you and your employer. In 2012, the Social Security tax is 4.2 percent for you and 6.2 percent for your employer, but in 2013 both rates will be 6.2 percent unless changes are made. The Medicare tax applies to all your income, no matter how much you make. The Social Security tax, on the other hand, applies only to a limited amount. As of 2012, the limit is $110,100, but it is adjusted for inflation. Any wages above the limit don't have Social Security taxes withheld. When you complete your W-4 at the start of your employment, you have the opportunity to claim that you are exempt from withholding because you didn't owe any taxes the year before and you won't owe any taxes for the current year. However, this exemption only applies to income taxes, not payroll taxes, so you'll still have the Social Security and Medicare taxes taken out of your paycheck. Do Social Security Taxes Withheld Count Toward My Tax Return? If you work as an independent contractor, you won't have any taxes withheld from your paycheck -- either income taxes or payroll taxes. While this may sound great, don't celebrate. You're still responsible for income taxes and, instead of payroll taxes, self-employment taxes. Self-employment taxes are equal to the sum of the employee and employer portion of the payroll taxes, because you are essentially your own employer as well as being the employee. You usually have to estimate what these taxes are and pay them quarterly to the IRS. Internal Revenue Service: Like Share Print Independent Contractor (Self-Employed) or Employee?